"I made this recipe for my picky eaters and they loved it." Place frozen French fries in a 11x13-inch glass baking dish and bake in preheated oven until golden brown, about 25 minutes. Heat a large skillet over medium-high heat. Cook and stir beef in the hot skillet until browned and crumbly, 5 to 7 minutes; drain and discard grease. Reduce heat to medium, add sloppy joe sauce and barbecue sauce to ground beef and cook until heated through, about 15 minutes. 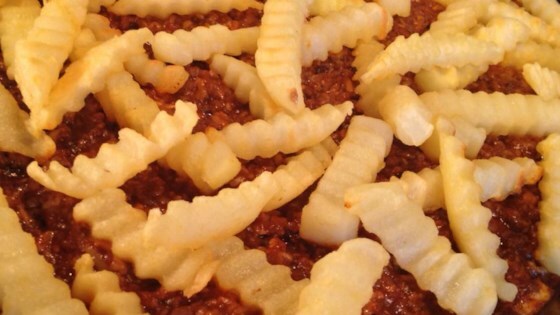 Pour ground beef mixture over French fries, sprinkle shredded Mexican cheese blend over top; return to oven and bake until cheese is bubbling, about 10 minutes.